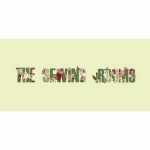 Across the third sector, there is increasing need for organisations to be even more entrepreneurial, innovative and enterprising to improve the sustainability, address current challenges and seize new opportunities – but it can feel lonely at the top. 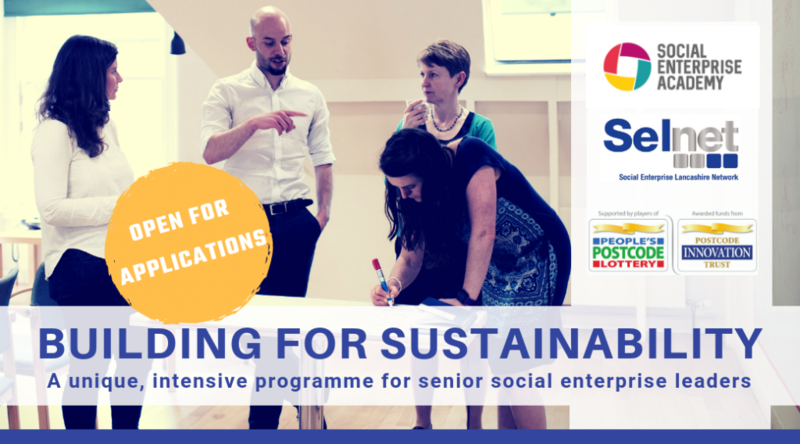 ‘Building for Sustainability’ is more than a personal development programme; It is about building future leaders within a professional peer group to help shape their organisation to have a greater social impact. Read the press release on our exciting new programme here. Bring together senior leaders, committed to developing and growing their organisation to the next stage, to share and learn together. Thank you for your applications to participate in the programme. 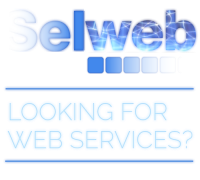 These are being reviewed and delegates will be contacted in the coming days. 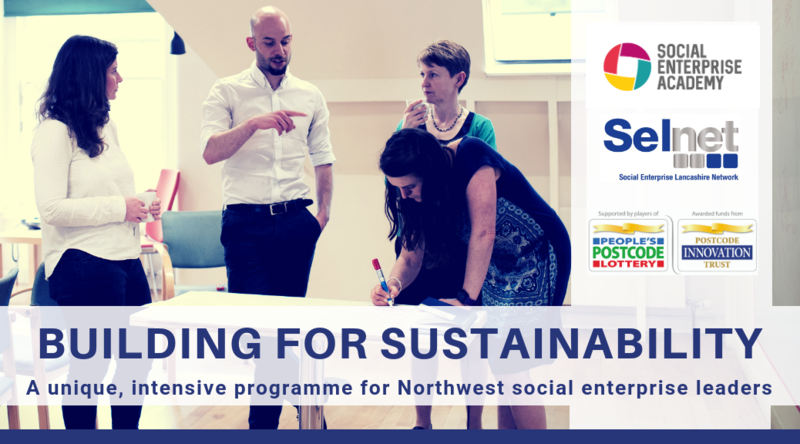 The ‘Building for Sustainability’ programme is delivered in partnership by the Social Enterprise Academy and Selnet and funded by the Postcode Innovation Trust. 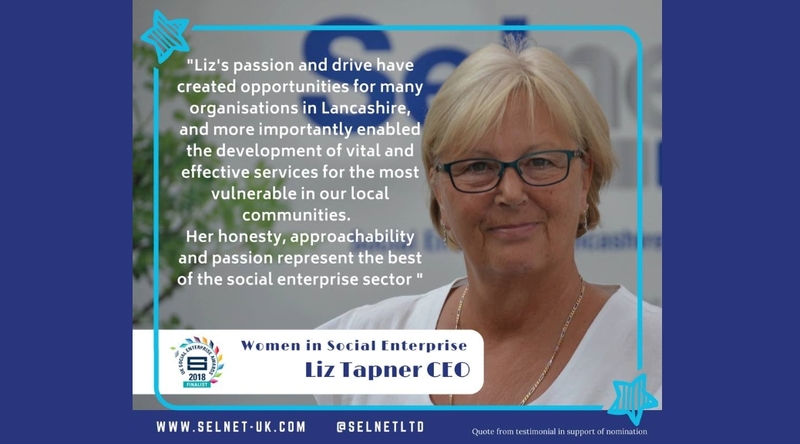 The Selnet team are delighted to announce that our CEO, Liz Tapner, is a finalist in the UK Social Enterprise Awards. 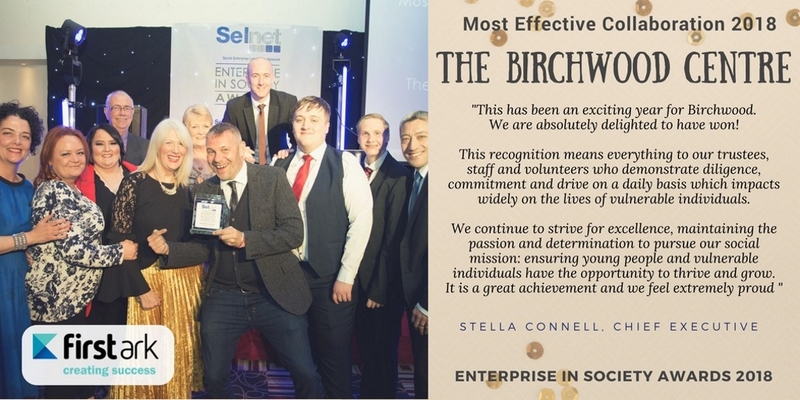 The Awards recognise organisations for their business excellence and contribution to society, as well as the achievements of people working at the heart of the sector. 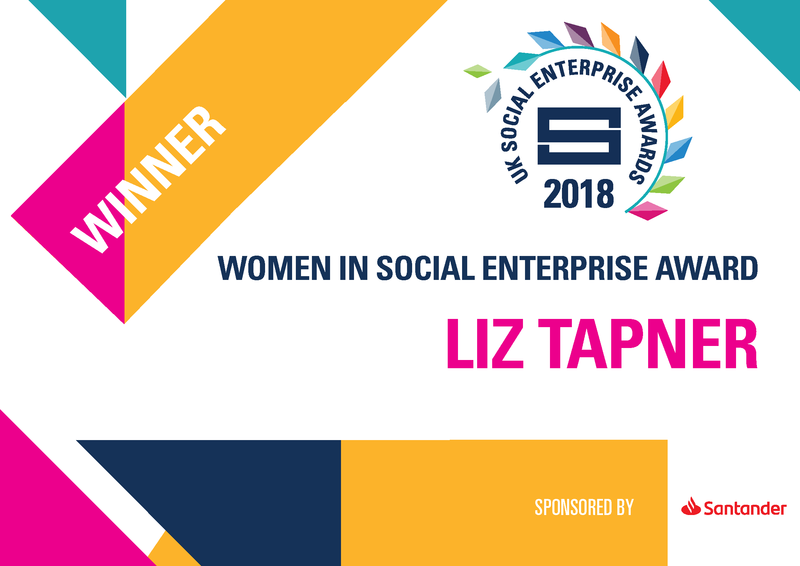 Liz is shortlisted in the ‘Women in Social Enterprise’ category, which celebrates women working in the senior leadership team of a social enterprise who represents excellence in her field of work. 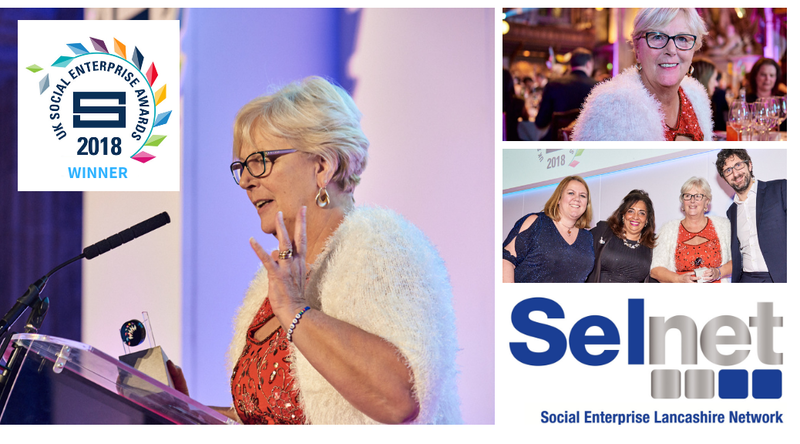 Earlier this year Liz was awarded one of the UK’s first Honorary Fellowships by SEUK. 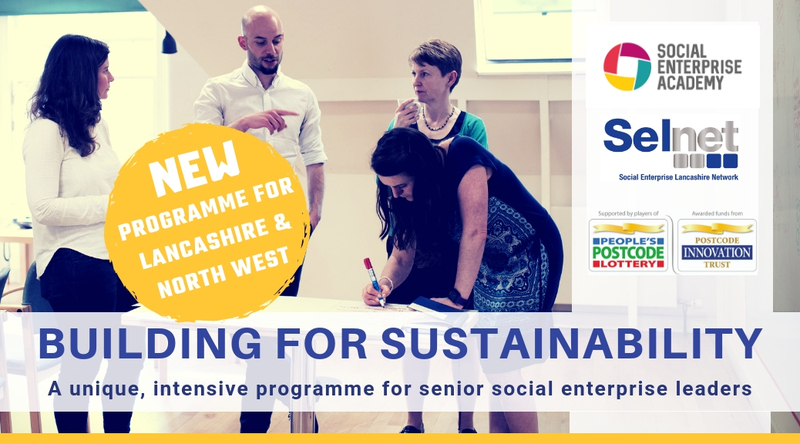 Social enterprises are transforming lives across Lancashire; from providing specialist support for disabled children and their families, to preventing youth homelessness, to providing outreach and engagement services for isolated communities and improving the confidence, prospects and wellbeing of disadvantaged people. 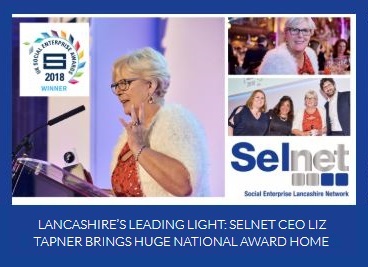 Each year Selnet, Lancashire’s social enterprise network, hosts the Enterprise in Society Awards to promote, celebrate and reward the achievements of social enterprises across the area. 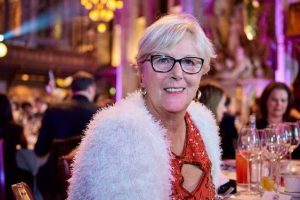 The Enterprise in Society Awards 2018, in association with First Ark Social Investment, saw 200 people from across the county gather at the De Vere Hotel in Blackpool for the award ceremony, gala dinner and celebration. 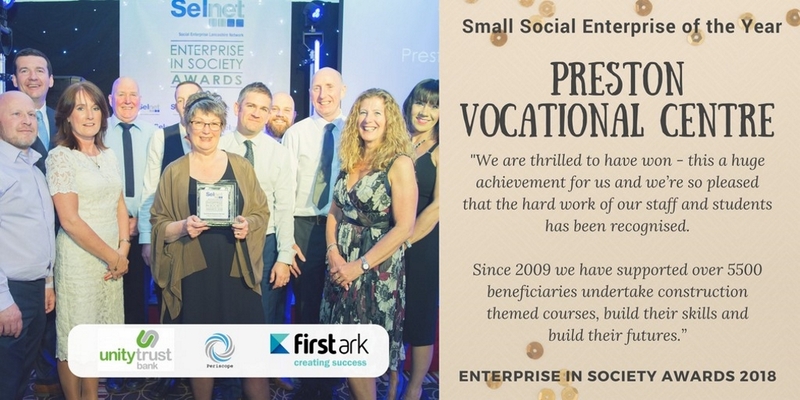 More than 20 community-focused organisations were shortlisted for 8 awards, including Social Enterprise of the Year, Most Effective Collaboration and the Enabling Ability award. “The impact these amazing businesses have really is transformative” said Selnet CEO Liz Tapner. 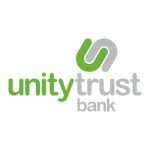 “Each social enterprise is rooted in our communities, helping vulnerable and disadvantaged people to overcome huge barriers. The successes we are celebrating tonight are felt by individuals across Lancashire who benefit from improved health and wellbeing, support to face daily challenges and newly expanded horizons”. 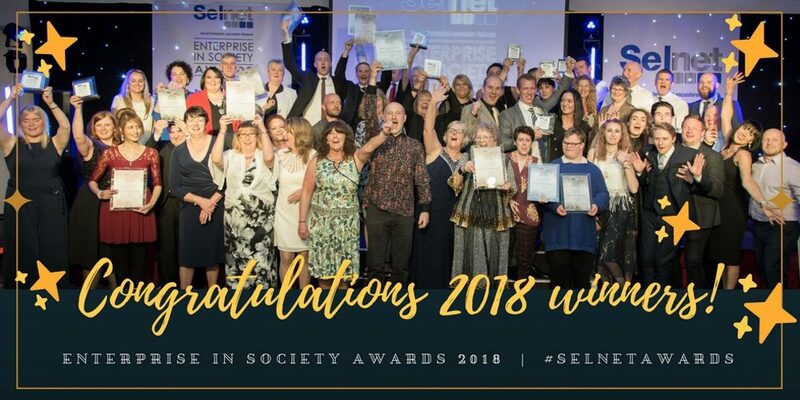 The Enterprise in Society Awards 2018 was held in association with First Ark Social Investment. 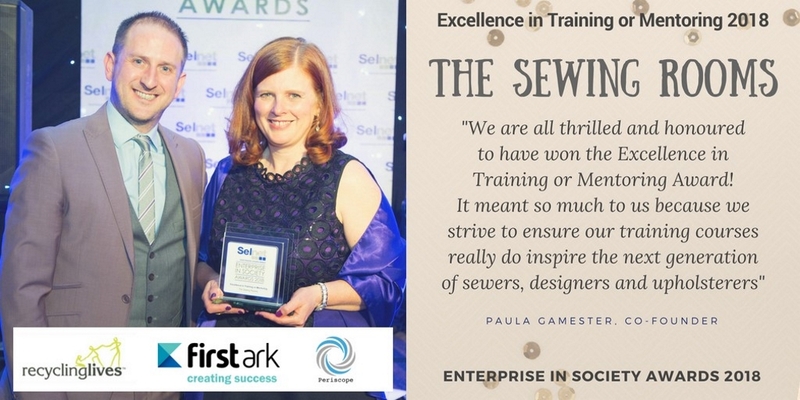 Selnet would like to thank First Ark and Recycling Lives, The Sewing Rooms, Periscope Productions CIC and Unity Bank for supporting this wonderful event and celebrating Lancashire’s vibrant social enterprise sector. Artz for All, based at the Artz Centre in Skelmersdale, have been recognised for their impact in Enabling Ability. Skelmersdale has significantly higher numbers of children and young people compared to the rest of Lancashire, with almost 40% of 0-15 year olds living in income-deprived households – almost double the national average. Despite elevated levels of economic and social deprivation, Artz for All are helping young people across Skelmersdale to look forward to a future that is decorated with ambition, no matter what. Up to 260 individual local young people are able to access an affordable, regular timetable of arts-related sessions in drama, dance and singing each week. The purpose of these services however, goes beyond the teaching of the arts; Artz students are fundamentally encouraged to raise their aspirations, dream big and grow as confident and capable citizens of their wider community. The Artz Centre prides itself on providing a vibrant, engaging and safe community venue that sets out to develop, nurture and challenge disadvantaged individuals of all ages from the local community, encouraging them to turn their negative experiences into positive outcomes. The Centre’s motto recognises that “It’s good to be different” and everyone who walks through their doors is encouraged to Aim High, Work Hard, Take Pride, Have Respect and Be Yourself. 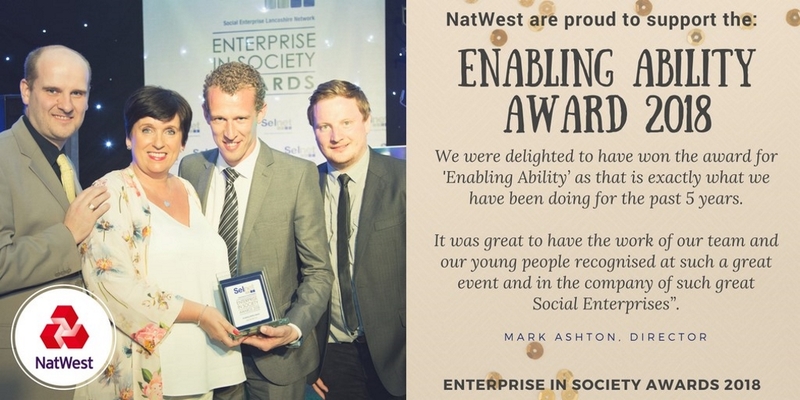 “We were delighted to have won the award for ‘Enabling Ability’ as that is exactly what we have been doing for the past 5 years,” said Director Mark Ashton. 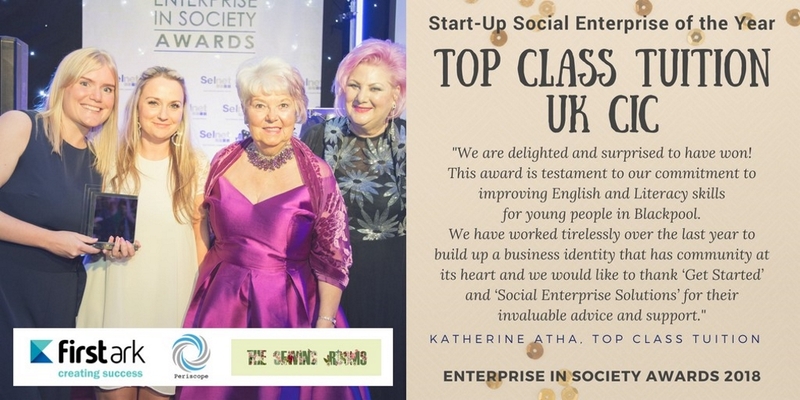 “It was great to have the work of our team and our young people recognised at such a great event and in the company of such great Social Enterprises”. 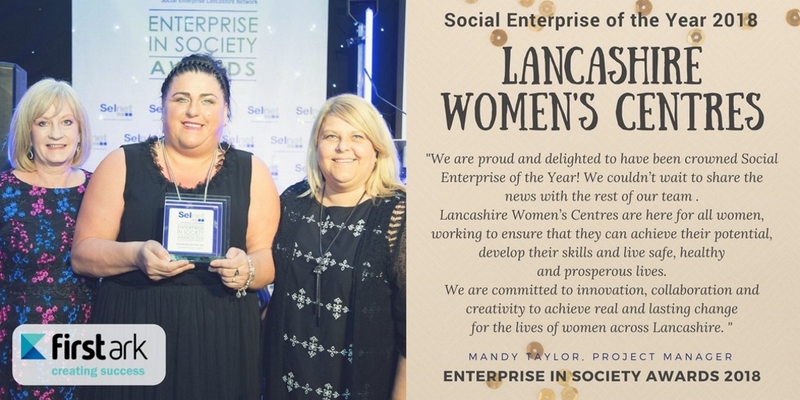 Lancashire Women’s Centres have been recognised as Social Enterprise of the Year for 2018 at the Enterprise in Society Awards in Blackpool. 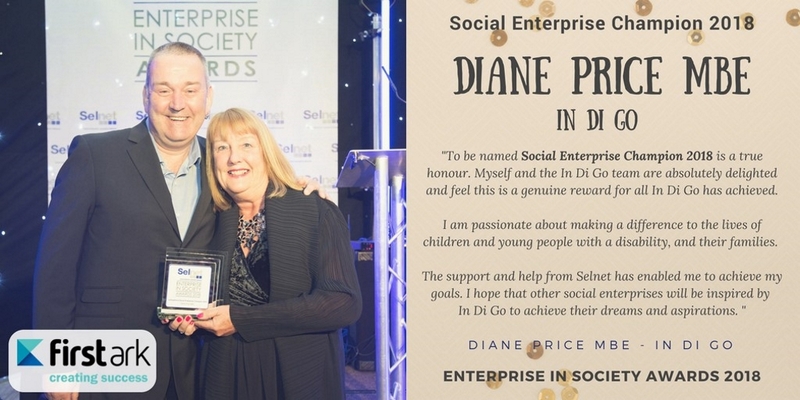 “We are proud and delighted to have been crowned Social Enterprise of the Year! We couldn’t wait to share the news with the rest of our team. “Lancashire Women’s Centres are here for all women, working to ensure that they can achieve their potential, develop their skills and live safe, healthy and prosperous lives. We are committed to innovation, collaboration and creativity to achieve real and lasting change for the lives of women across Lancashire. We believe that Every Woman Counts, with this ethos guiding all services. Our vision is that women, and their families, in the communities we serve are able to achieve their potential, develop their assets and skills and live safe, healthy and prosperous lives. Lancashire Women’s Centres was established in 1982 in response to tackle high infant mortality rates in Blackburn. 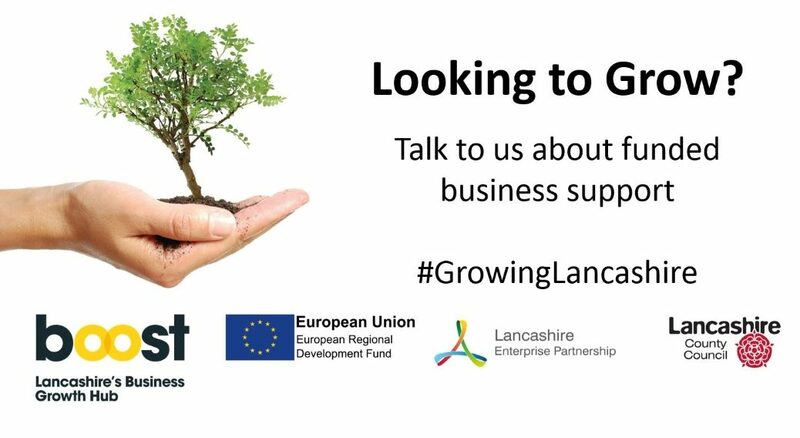 Since then their women-led organisation has continued to develop and evolve to respond effectively to the needs of women in Lancashire, expanding from one centre in Blackburn to a network of five centres across the county. Lancashire Women’s Centres are committed to continual innovation and recognise the significant value of collaboration and creativity as the best route to achieving real and lasting change for the lives of women. Lancashire Women’s Centres’ volunteers play a vital role in ensuring that the community is embedded in their work, enabling them to reach more women and bring on board vital skills and knowledge. 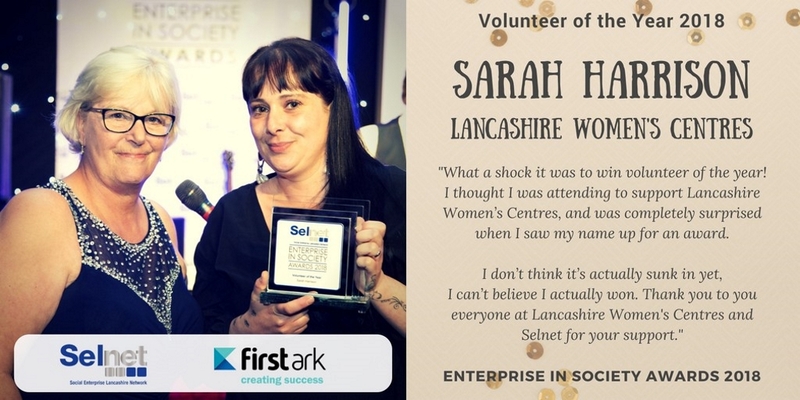 Sarah Harrison, a voluntary member of team was awarded the Volunteer of the Year award for her dedication, inspiration and growth within the organisation.